I have something very serious to talk with you about today. There is a great travesty occurring in our nation. A great injustice! And I cannot, no I WILL NOT sit idly by for one moment longer. And please forgive my boldness as I callously divert from the true spirit of this blog. I try so very hard to have fun here. To keep things light. But enough is enough. This has to stop. There is the little tiny candy that I hold near and dear to my heart. I have loved it from the moment I tried it. Its candy corn. To be more specific Brach’s Candy Corn. The REAL stuff. That stuff? Over on the right? IMPOSTOR. I dislike them very much. I dislike them on a crutch. I dislike them on a spoon. I dislike them under the moon. I dislike them all the way to mars and back! I would not eat them, not for all the money in a sack! Why oh why are the grocery stores carrying them? Why do companies even try to replicate the awesomeness that is Brach’s Candy Corn? It must be stopped!! So anyway. While I dislike the fake version, I have intense adoration for the real stuff. Hence this cake. Which I am pretty sure has been made a million times before. 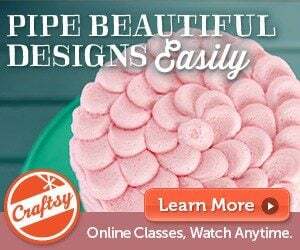 Except this is kinda new way to frost a cake. At least I haven’t seen much of it around, so I figured why not a tutorial? Prepare cake batter. Tint one recipe cake batter yellow and place in a prepared 9-inch cake pan. Prepare another white cake and tint orange; place in prepared 9 inch cake pan. 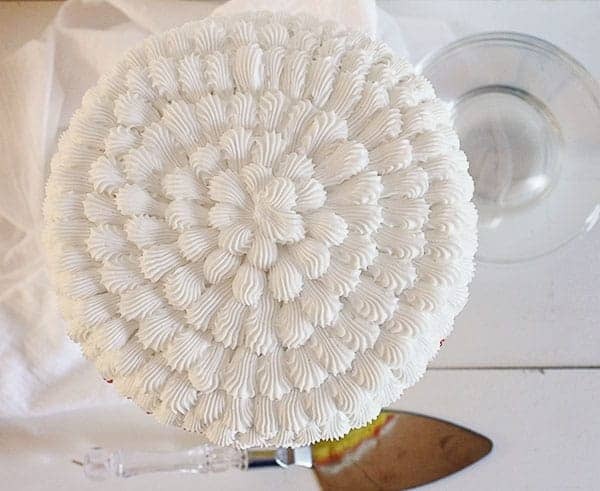 Make last white cake and place in prepared 9 inch cake pan. Bake for approximately 10 minutes longer than the recipe directions call for. 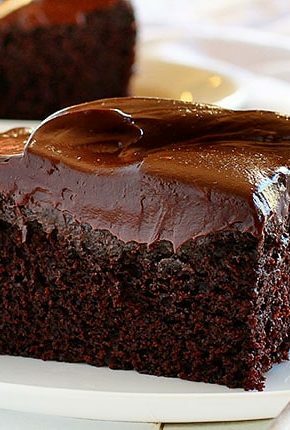 When cakes are done baking remove from oven and allow to cool to room temperature in pan. Carefully remove cake from pan and determine which is the shortest cake. Level all the cakes to that level. Next came frosting. There are two full buttercream recipes here, which is a lot of frosting. 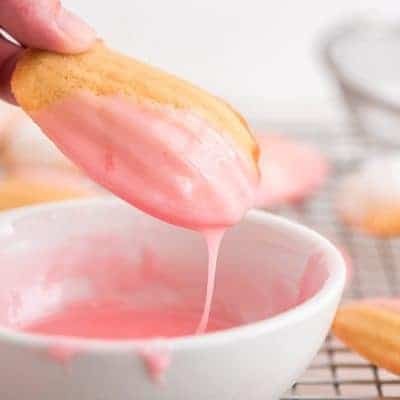 Divide one batch equally into two parts then tint one yellow and one orange, trying to match the shade of your cooked cake. 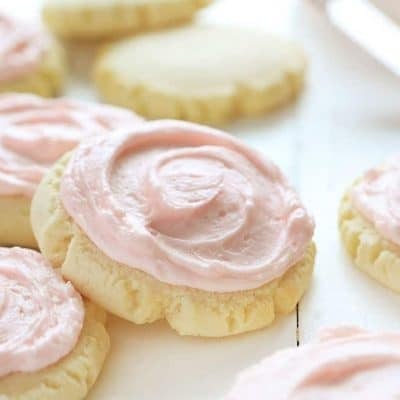 Leave remaining batch of buttercream white. Cover with plastic wrap until ready to use. 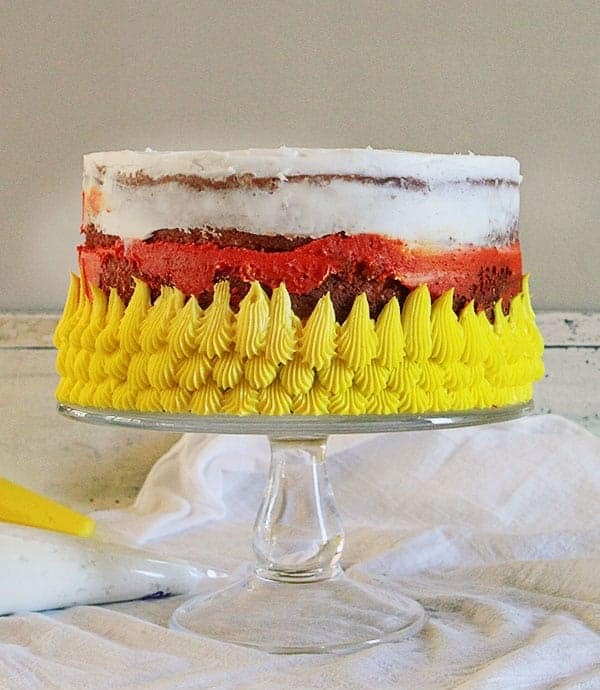 Start by placing your yellow cake on the cake stand. Cover in approximately 1/2 cup of yellow buttercream. Carefully place orange cake on top. Cover with approximately 1/2 cup of orange buttercream. 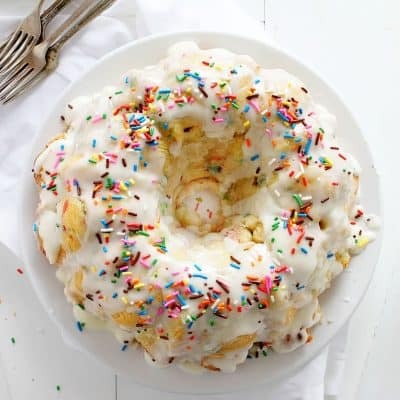 Place white cake on top. 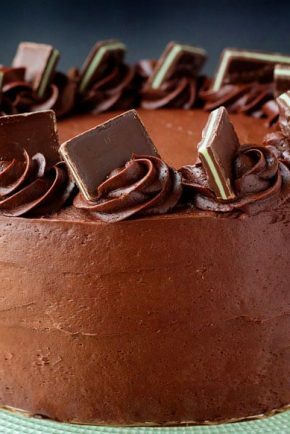 Smooth out an excess frosting. As you can see above, I chose not to do a crumb coat. I wanted to be sure I had enough frosting! With the two recipes of buttercream it turns out I did, so I would recommend covering your cake in a crumb coat of white buttercream. I place ALL my frosting into plastic disposable pastry bags. I then get a new clean bag with the tip I am using, in this case a #32 tip, and coupler set. 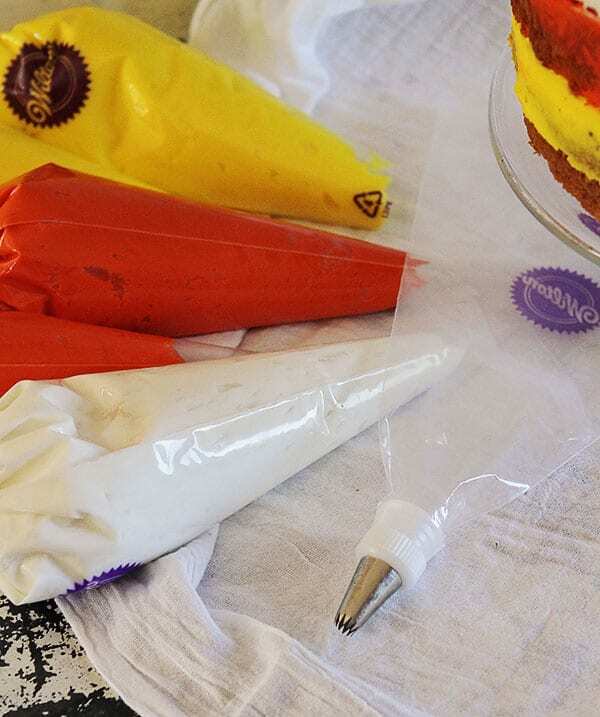 Cut off about 2 inches from the tip of the bag with your first color and place the frosting into the bag with the couple set and #32 tip. Pipe out decoration and then when the frosting runs out, remove empty frosting bag from bag with tip and coupler. Grab new frosting bag, cut off tip and drop into bag with tip and coupler. When you have a new color change out your frosting tip. 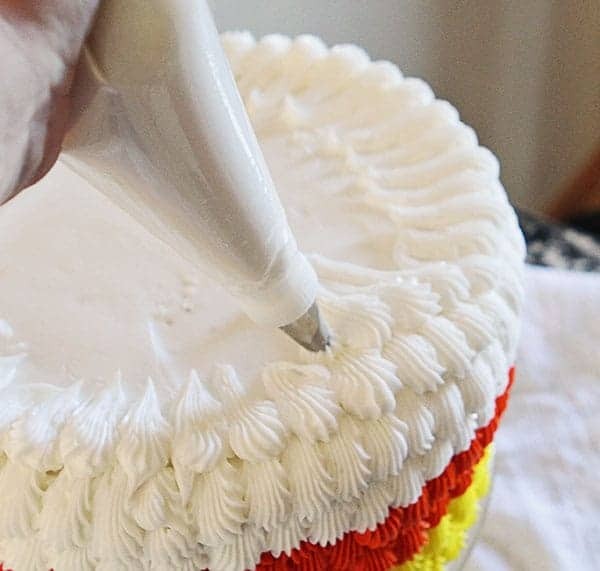 Starting with the yellow frosting in the bag with the #32 tip; place your tip at the very base of the cake. Apply pressure and then swoop UP. If you are at all uncomfortable with the motion, practice on a piece of parchment paper until it feels right. At this point you can determine how big you want each dab to be; just try to remain consistent around the entire cake. 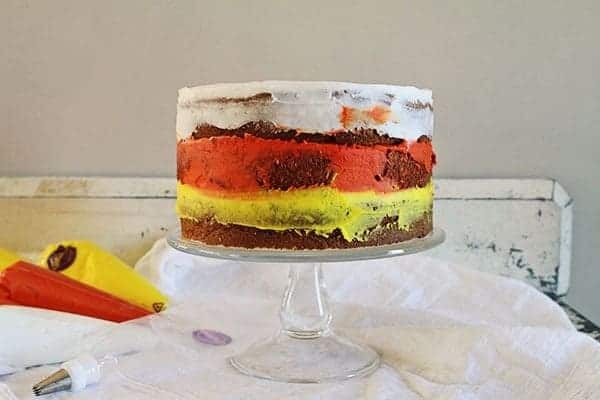 Continue this motion around cake until you have completely covered the bottom of the cake. For the next row, place your frosting tip right in between the dabs from the bottom row. 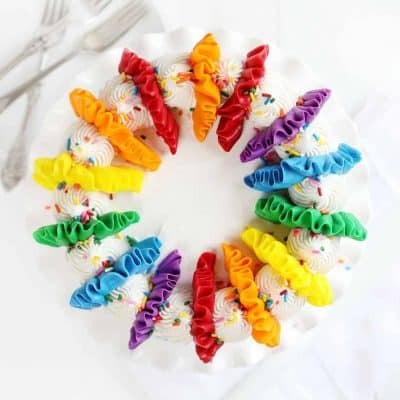 Repeat the same motion as you did above and do this around the entire cake until you have two full rows of mini scallops. You will be doing three full rows of yellow, so once you have completed the second row, go back in and do a third in the exact same way. Remove yellow frosting from your bag with the coupler set. 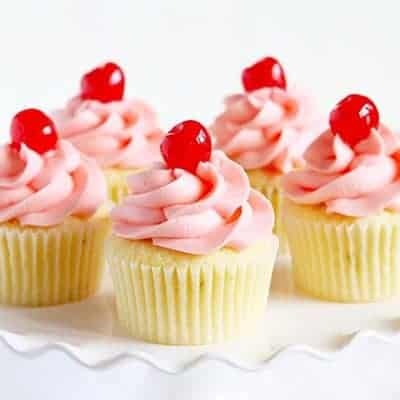 Change out to a clean #32 tip and then add orange frosting. Just a note: I pipe one handed and was able to turn my cake around with the other hand. 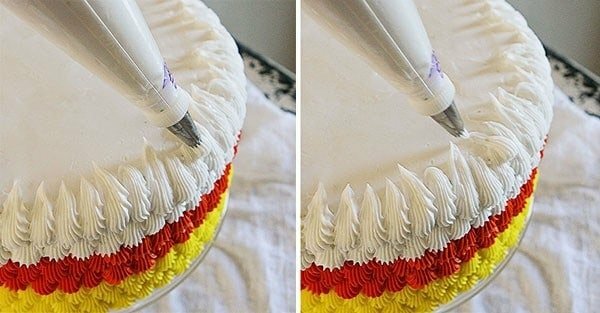 If you want to make the piping even easier, place cake on a rotating cake stand. The orange dabs are done in the exact same way as the yellow. Do one row, go back in and add another row, then finish with a third row. This is how the orange layer looks when done. 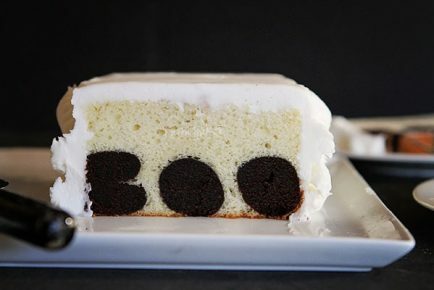 You can see it will overlap onto the white layer of cake and that is great. If you are anything like me you will want every single dabs to be perfectly uniform and placed just right. Well, I got over that pretty quick! In my humble opinion, imperfections are beautiful too. If you have a dab you dont like, simply remove it carefully then go back in and pipe another one. This cake is very forgiving! For the white layer, do the dabs exactly as you have done wit the yellow and orange. I did two rows of white dabs around the cake. Looking back at the finished cake I could have fit three in, but didnt. Be sure to carefully look at your cake and see what will work best. The third row I started at the very edge of the cake then swooped IN, towards the center of the cake. I went around the cake until I reached the center. If you are a faithful iambaker reader you will recognize this technique from this Mini Heart Surprise Inside Cake I did! 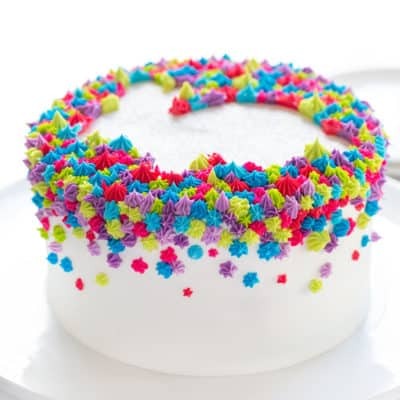 Keep going around and around the cake until you reach the center. When you get to the center just take extra cake to make your final dabs as uniform as you can. Even if they are not its ok, the over effect is still quite lovely. So lets re-cap. All impostor candy corn is wretchedly bad. Brach’s candy corn is the real, the best, and the only candy corn allowed in this house! As you can see, I may have a small obsession with them. 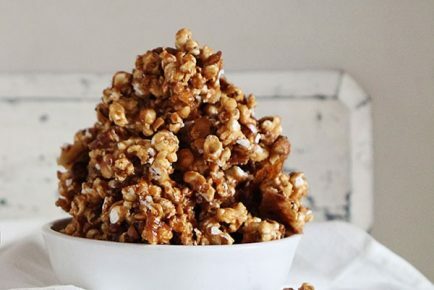 It is my understanding that some people even add peanuts to theirs. And M&M’s or some such nonsense. I am afraid this is the dividing line between us. Difference in political and religious beliefs? I can handle that. Nuts in my candy corn? Get outta here. Just candy corn. Lots and lots and lots and lots of CANDY CORN! And cake. Always lots of cake. My apologies for this longest and most picture heavy post I have ever had the pleasure of assembling. Please do let me know if you have any questions. And lets brainstorm for the next cake! Should we tackle this one for Christmas? Red, white and green? Should we take on New Years and make it black, white and gold? How about Fourth of July with red, white and blue? How about a rainbow with all the beautiful colors?? The possibilities are endless! Cant wait for the next one, which you are sure to see very soon! 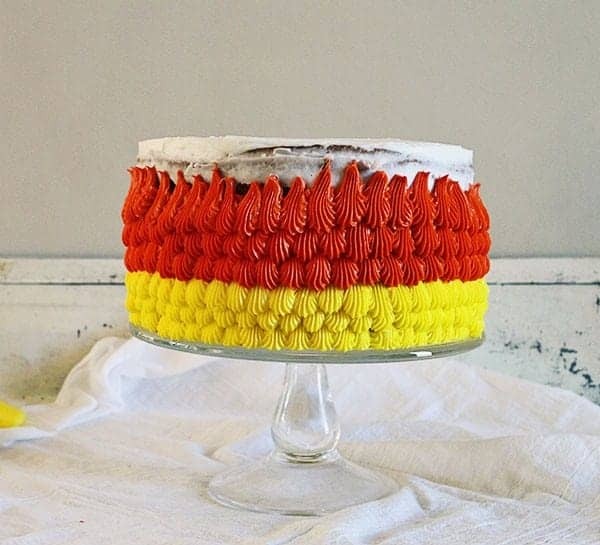 Feel free to check out my other Candy Corn Cake! Its based off of the Indian Candy Corn. Amanda this cake is so dang cute!!! I am sharing it on my FB page tomorrow 🙂 I think I need to make something like this for Halloween! 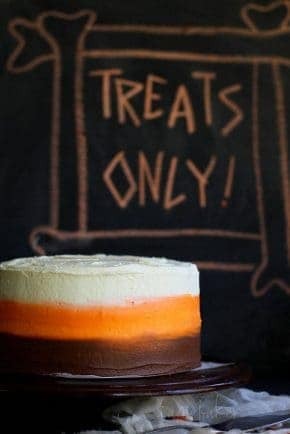 Best Halloween cake ever! This cake is stunning, Amanda. Great tutorial! Pinned! Nothing like the REAL Brach`s Candy Corn! The imposters taste like grainy cornstarch..ick! Such a cute cake. You always make decorating look so easy. I was a little confused too by the directions on the icing bags, but I think I got it now. 🙂 BTW, I have mixed Brach`s Candy Corn with salted peanuts and the combo tastes like Payday candy bars..yum. I am SO WITH You. Brachs or none at all!! Love the cake! how do you get your cakes to be perfectly flat and come out of the pan perfectly? I too am a candy corn lover, however, my dear husband introduced me to a candy corn that’s superior even to my beloved Brach’s. It’s by Buddy Squirrel. It is made with real honey, it is truly candy corn heaven! If you ever get the chance to try it, DO! But it’s sad because it’s a lot harder to get your hands on as it’s in a specialty shop, usually in a mall and it costs far more:( But totally worth it, to the extent that it’s the only candy corn I’ll buy, so I get it once a year! 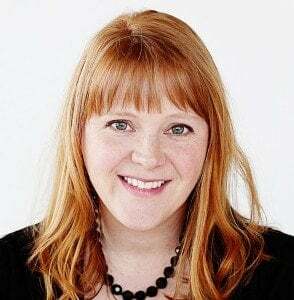 Beautiful as ever – candy corn rules!! Question – do you put all of the cake batter into One 9 in cake pan? Or do you cook 2 and make 2 cakes? 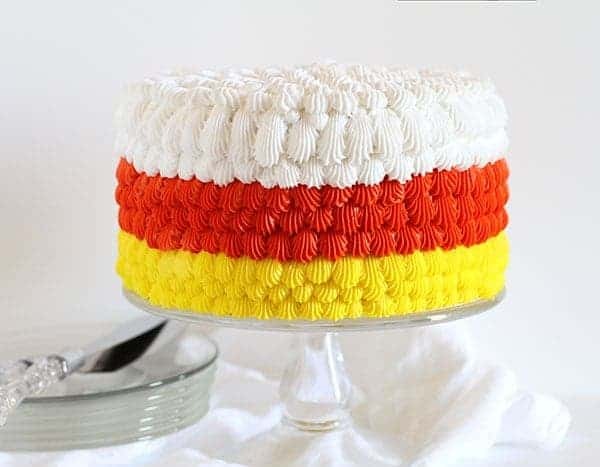 OK, so I am making this cake as we speak using 9″ layer cake pans and, unless I had put parchment collars on the pans, I would have batter all over the bottom of the oven!!! Do you use spring form pans? Well, why don’t ya tells us how you really feel. I’m with ya. What is this world coming too.. Some poor kids might not ever have a chance to even taste the Branches.. They might not even know the difference! Gorgeous cake as always btw! You are 100% correct! 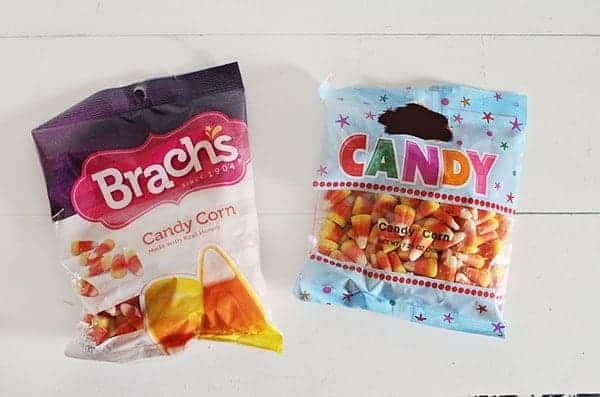 Brach’s is and always will be the only candy corn for me, too. However, I am glad you stepped down from your soapbox to create this great homage! 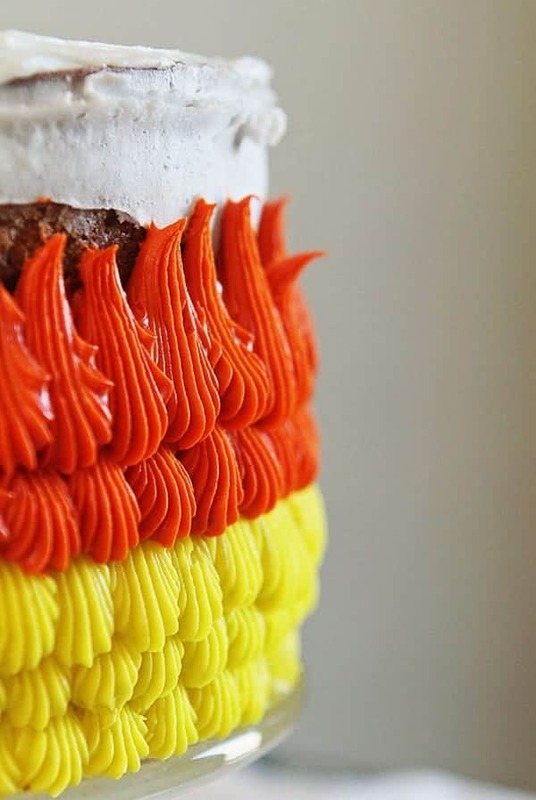 I LOVE that picture with all the candy corn around the slice of cake…it’s gorgeous! Pinning right now! Like Linda, who commented above, I’m an Australian, and I have to ask – what the heck is candy corn? 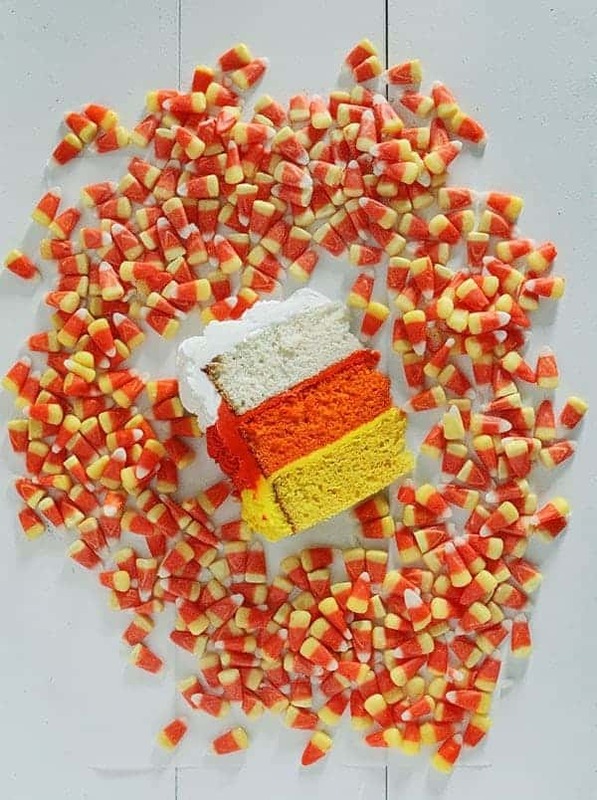 All the lovely American baking blogs I read are making candy corn inspired treats, and I don’t understand! Is it like a boiled lolly? Or is it chocolate inside? Take this opportunity to tell me all about what I’m missing! Many thanks, Amanda, and of course- beautiful cake! Great tutorial and idea. So colorful and fun. Thanks for sharingit. Amanda this is so beautiful! You keep amazing me. You are such a wonderful friend Rowaida! Thank you! 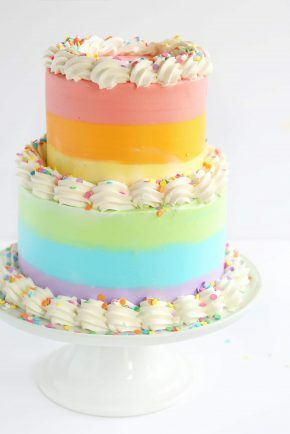 This cake looks so pretty!! 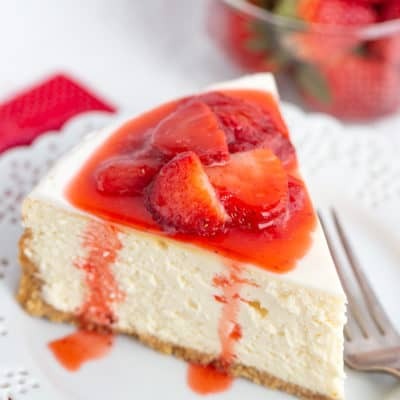 I want a slice of it right now! I LOVE CANDY CORN TOO!!!! I am NOT alone, so nice to know. 🙂 Wonderful post, I am a new reader, amazing pics and how thoughtful to share your obsession with the public!!! 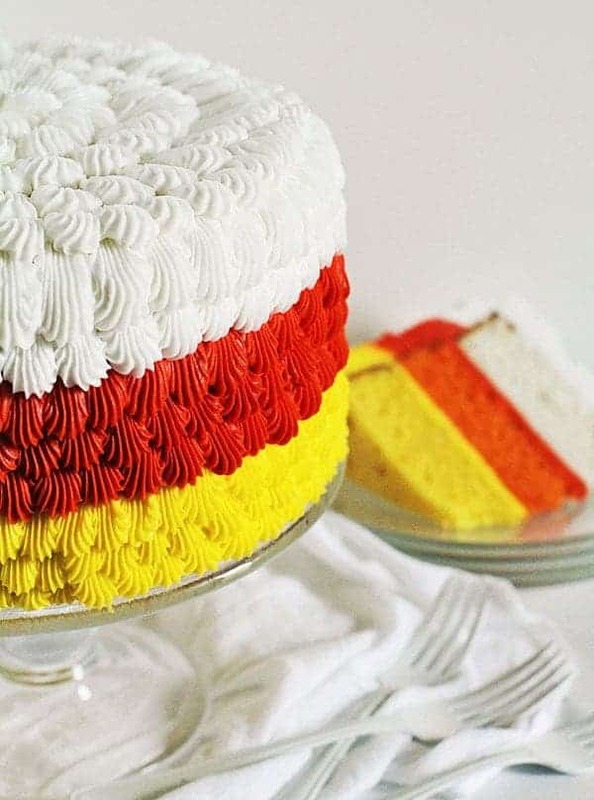 I LOVE candy corn and I LOVE cake! So this is perfect. 🙂 Your cakes are always beautiful and I have used several of your ideas in my own cakes, so thank you! A few questions about this one. First, you mentioned this about the baking part: “Bake for approximately 10 minutes longer than the recipe directions call for.” Why is this? Just curious, as I try to be careful not to overbake my cakes. 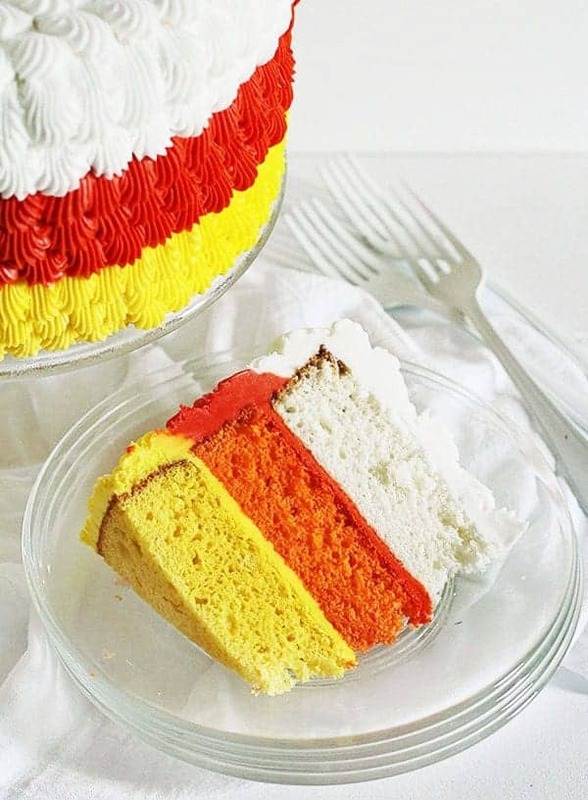 Also, any ideas of how to incorporate candy corn flavor into the cake? 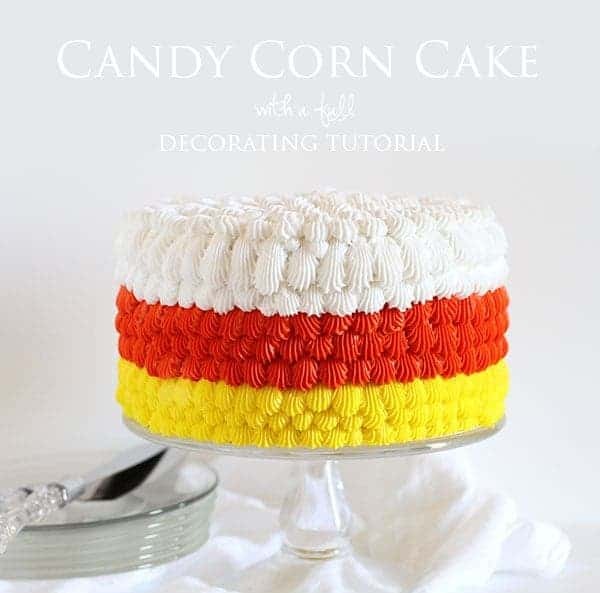 Or incorporate actual candy corn into it? Hi Katy- Since you are baking one entire recipe into one 9inch pan, it will need to bake longer. There is more batter, so needs a bit more time. 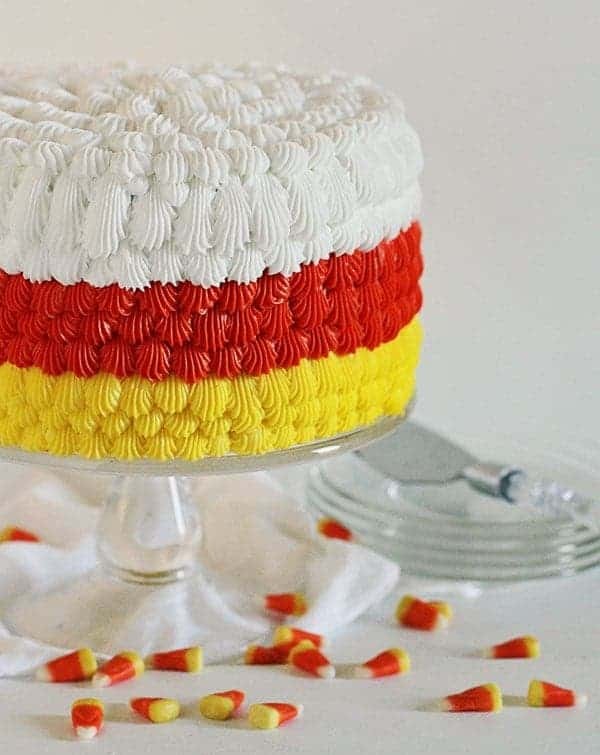 I’m from Australia so I have no idea what candy corn is, but your cake looks brilliant. 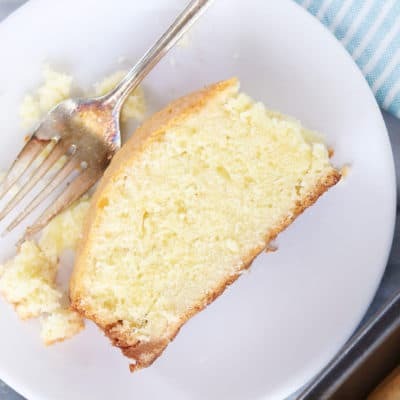 Thanks for your white cake recipe it is reliable and tastes great. 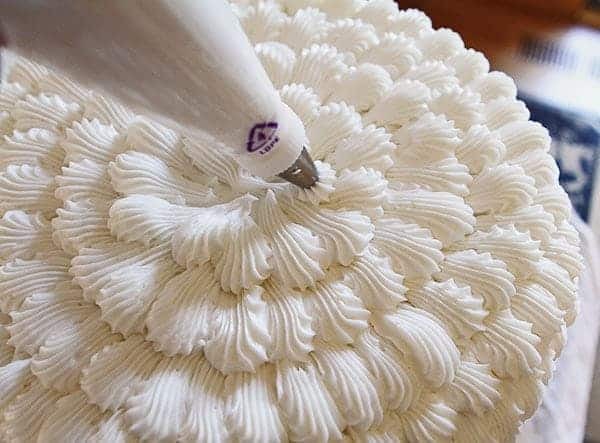 I have just started out decorating cakes for people after years of just decorating for my family and friends and this cake recipe is perfect.